Missing Beardie please help. 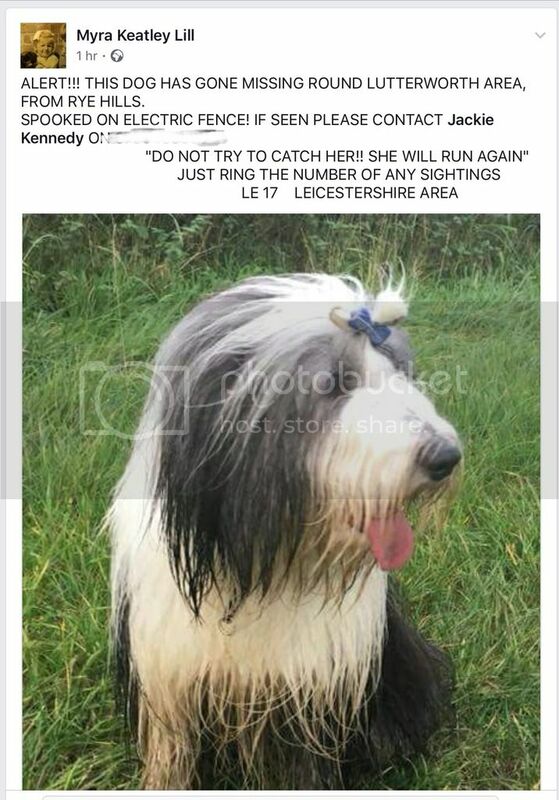 A friend of ours who many of you will know; Jackie Kennedy has lost Lizzie, her beardie girl in the Lutterworth area earlier today. She got a fright and bolted. Any help in finding Lizzie would be greatly appreciated. There's been a sighting near the coventry / bitteswell road - fingers crossed everyone. Please share or copy this as the feed appears in lots of places. Thank you. I do hope she's found soon, safe and well. HAPPY ENDING, Lizzie is home. She's a bit dirty and has a couple of cuts but seems otherwise ok. Jackie is checking her more thoroughly now but she is safe and seems well. Thanks to everyone who helped, advised of sightings, shared posts and offered comments of support. Beardie people are amazing. OH that's a relief! Your friend must be overjoyed. Good that Lizzie is ok.
Jacquie, I quite agree with you. Thank goodness! So glad she's safe and ok. Thank heaven she's safe and home.